The Adam Merrick Team of Keller Williams Premier Realty at (309) 282-1000. Peoria real estate is the choice of many people who prefer to live in a medium-sized city. 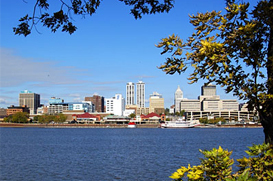 Peoria, Illinois has a population of 115,007 and contains 39 neighborhoods. With many interstates and U.S. Routes providing access to this city and surrounding areas, it is a choice of several of the smaller villages within the county when it comes to jobs, entertainment and recreation. Interstate 74 runs through downtown and Interstate 474 provides a southern bypass for I-74. Interstate 155 connects to I-55 providing residents with access to St. Louis and Springfield. Choosing Peoria homes for sale will allow residents to be a part of the largest city on the Illinois River as well as the county seat of Peoria. Outside the Chicago Metropolitan Area, the Peoria Metropolitan Statistical Area is the fourth-most populated metropolitan area in Illinois. The metro area has a population of 372,487. The Chicago metropolitan area, the Metro-East section of the St. Louis metropolitan area and the Rockford, Illinois metro area are the three largest within the state. Peoria was first settled in 1680 when a fort was built here by French explorers. The original fort burned and in 1813 another, which was named Fort Clark was built. When the county was organized in 1825, Fort Clark was renamed Peoria. In 1835, Peoria was incorporated as a village and in 1845, it was incorporated as a city. Peoria real estate includes many homes that were built between 1940 and 1969. There are a number of historic homes that were constructed prior to 1939. Some new construction and homes built from 1970 to 1994 are also present. The majority of homes are single-family residences and some small and medium sized apartment buildings. Residents of Peoria real estate are served by the Peoria SD 150 School District, which has 40 schools. There are approximately 13,951 students enrolled in schools within this district. Due to the demographics and the culture of this city – mainstream Midwestern – it is considered a symbol of the average American city. It is the headquarters of Caterpillar, Inc. and one-fourth of the city’s economy is supported by healthcare. Peoria is the location of a United States Courthouse. The downtown area includes medical, educational, convention, governmental and corporate facilities. There is an art, entertainment and dining area near the riverfront and the downtown areas also includes residential high-rise developments including lofts, condominiums and apartments. Many warehouses in this area have been converted to residences.